It’s easy to get overwhelmed, especially during the holidays. Take time to give thanks as a family with a gratitude jar – a fun way to provide a visual reminder of the many blessings in our lives. This time of year many people are making New Year’s resolutions, focusing on all the ways they can improve their lives. While this can be a great thing I think it’s important, especially as a parent, to balance this with all the things that are right in our lives. How blessed are we as a family? Do my children know how blessed we are? How often do I share my thankfulness with them? Probably not enough. It’s easy to feel overwhelmed with our everyday lives and reflect that to our children. Too often my kids hear how we are running late or how we have to run another errand. What they need to hear more of is all the things we can be thankful for. That’s where the gratitude jar comes in. What is a Gratitude Jar? 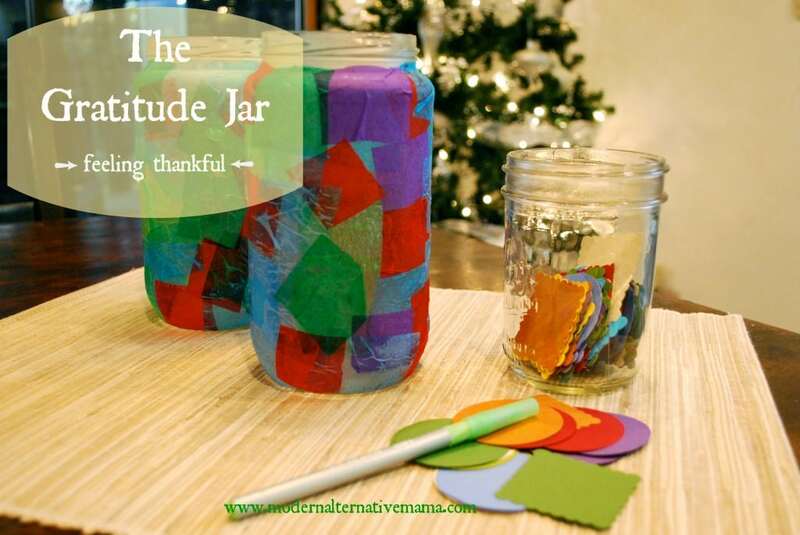 A gratitude jar is a fun way to provide a visual reminder of the many blessings in our lives. Basically, it’s a place to write down and keep all the things you are thankful for. Whenever you are thankful for something, whether it’s an activity, a kind act, a person or simply some detail of your everyday life, you write it down on a slip of paper and stick it in the jar. Over time, you’ll accumulate a jar full of all the things that make your lives beautiful. There are many different ways you can fill your jar. You can choose to add to the jar daily or just when you feel like it. I’ve found my kids like to go through gratitude “spurts” and put many things in the jar at once. To involve your younger littles who aren’t yet writing, you can either write their notes for them or have them draw pictures of what they are grateful for. I like to add a caption on the pictures so we can remember what their drawings were. It can also be helpful to add to your jar on those days you or your littles are struggling. Having a tough day? Think about all the blessings you have and you’ll probably feel a little better. What Do you Do with Your Jar? Save it for Thanksgiving and read them as a family. Read them at the end of each year. Read a few whenever you’re having a tough day or need a pick me up. Pick your favorites and frame them. Both writing and reading our thankful notes help us develop our appreciation of all we have to be grateful for, but what I love most is reading our little notes. It’s such a sweet experience to pick out random notes from our jars. Some of our notes are simple everyday things, some are silly, some are cherished memories and some are serious. But no matter what is written on the note, reading them together as family lets us relive those little moments. All you really need is a container, a pen, and some paper to get your gratitude jar going. Because I wanted my littles to be active participants in filling the jar, I wanted to get them excited about it by decorating their jars. We chose to cover ours with a tissue paper collage. If you’d like to do the same check out my instructions below. *You can also use Modge Podge for this but the glue is much cheaper and that’s a good thing when little people are using it liberally. Step 1: Cut or tear your tissue paper into small pieces. Step 3: Set your kids up with the jars, tissue pieces, and paint brushes. Step 4: Paint a layer of glue on your jar. Step 5: Place a piece of paper over the glue then brush a final layer of glue over the paper. Step 6: Repeat until your jar is covered or you are happy with the look. Step 7: Allow to dry completely. Step 8: Next, cut out pieces of paper for inside your jar. If you have any craft punches you can use them to do this too. That’s it! Keep your paper pieces and pen next to your jar and fill it whenever you want. Have you signed up for our 31 Days to Better Health and Wellness challenge yet? It’s not too late!! Read all the details about how to become a more beautiful you in 2014! How do you cultivate thankful hearts in your family? You wouldn’t happen to be at Beale AFB, CA…that’s where I am.. 🙂 Happy New Year!